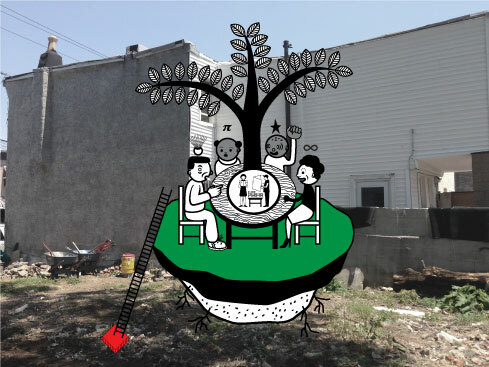 Playgrounds for Useful Knowledge was a pilot project which transformed transformed a vacant lot at 632 Jackson Street in South Philadelphia into a community space and a strategic hub for cooperative thinking, spatial inventiveness, and environmental restoration. Synergizing the seemingly contradictory terms “play” and “use” into a tool of joyful learning, Playgrounds offered a platform to share collective and individual knowledge produced in an area marked as much by its diversity as by the cultural distance and lack of communication between the populations that inhabit it today. 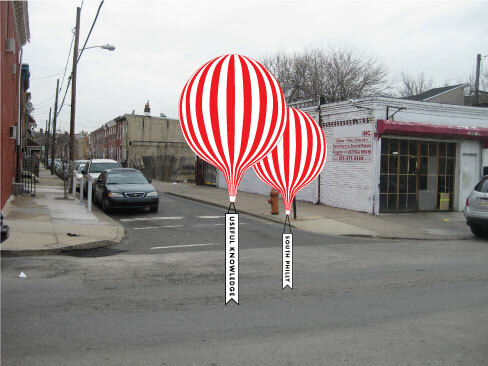 Conceived by Cohabitation Strategies (CohStra) as a platform for elevating everyday individual and community wisdom into engines of urban change at the scale of the neighborhood, Playgrounds centered on the appropriation of land in a moment when South Philadelphia is undergoing extremely rapid urban development, with its associated consequences of displacement, overdevelopment and land speculation. CohStra collaborated with a variety of neighborhood partners to re-imagine together their community and more actively participate in the shaping of the city. The project speculated on the formation of a long-term community-led playground of ideas for urban and social restoration. Playgrounds for Useful Knowledge focused on an area CohStra dubbed “The South Seven,” comprised of seven interconnected neighborhoods of eastern South Philadelphia—Passyunk Square, East Passyunk, Dickenson Narrows, Greenwich, Pennsport, Lower Moyamensing, and Whitman—known for their rich cultural and ethnic diversity, and, in recent years, dramatic social and spatial restructuring. 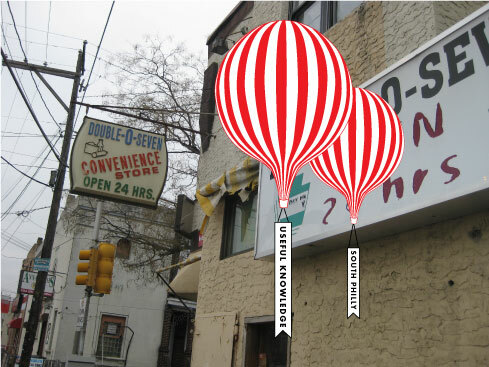 Real estate development has been steady in the northern area due to its proximity to downtown Philadelphia. As with many other working-class inner-city districts strongly related to the base industry of the city, over the last century South Philadelphia has experienced depopulation and urban decline due to deindustrialization, redlining, suburbanization and decrease of tax revenues. Originally settled by working-class families of Irish, Italian, and Eastern European descent, as well as African Americans that arrived during the Great Migration, today The South Seven are also populated by more recent immigrant and refugee communities from Cambodia, Thailand, and Vietnam, as well as Mexico and other Latin American countries. However, newcomers are facing obstacles to thrive in the central area—specifically the neighborhoods of Greenwich, Lower Moyamensing, and Whitman—where poverty, unemployment, and decline are concentrated. Affinity with such systemic conditions is fundamental to CohStra’s way of researching and intervening into a site, using traditional quantitative tools and action-research methodologies to gain a multidimensional understanding of the structures underlying persistent urban problems. A non-profit cooperative that employs trans-disciplinary methods drawn from art, theory, performance and theater, activism, architecture, and urbanism, CohStra (Lucia Babina, Emiliano Gandolfi, Gabriela Rendón, and Miguel Robles-Durán) aims to produce new spatial relations between citizens through the design of urban pedagogical frameworks, community workshops, performance, and urban campaigns that call for, and exercise, the right to the city, particularly in relation to migrant and marginalized communities undergoing urban displacement. Playgrounds for Useful Knowledge proposed an alternative way of producing urban space steeped in the ludic imaginaries of the artistic and architectural avant-gardes of the 20th Century. The Dadaists, the Situationists International, Constant, Aldo Van Eyck, and Buckminster Fuller, among others, proposed the emancipation of time and space through play and the reuse of bombed and abandoned lots as playgrounds and spaces of leisure and imagination, a radical opposition to the urban dystopia left by the Second World War. This project was also inspired by more recent artistic and activist occupations of private and public spaces, such as the Occupy movement’s strategy of taking over city squares in 2011-2012 in which CohStra was actively involved. The interruption of daily life caused by these outbursts of collective protest are playful and creative yet also seriously tackle systemic injustice, reminding us of the disruptive potential of play as a powerful form of public ritual where new ways of being together and of inhabiting our shared spaces can be rehearsed. 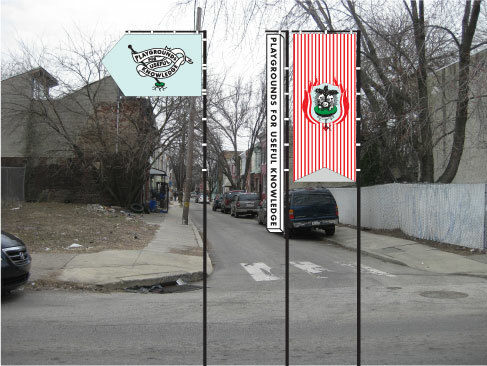 This project was born out of a residency with the City of Philadelphia Mural Arts Program by Curator Lucía Sanromán, who in 2013 worked closely with Shari Hersh, Senior Project Manager, to reconsider the approach to infrastructure and object-oriented procedures of the Restored Spaces Initiative Hersh spearheads. 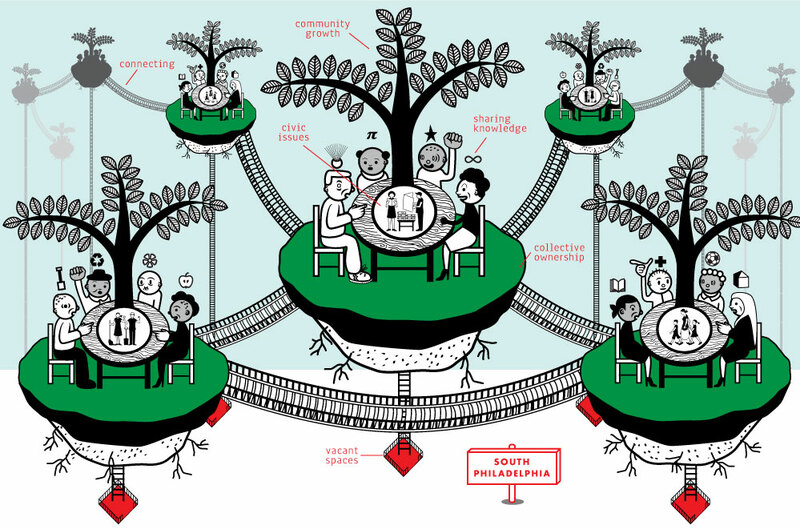 Its aim is providing the tools necessary for deeper, longer-term investment in the needs and preoccupations of specific communities and in this way allow for an endogenous participatory process that strengthens social links and understands local wants and dreams. This community-led, process-based approach marks an evolution in the forms of participation and co-production historically deployed by Mural Arts that allows for a more sustained and resilient interaction of the Restored Spaces Initiative with a rapidly changing city. Playgrounds acknowledges local cultures and values while also providing an environmentally low impact meeting, learning, and playing space to engage in collective practices of self-recognition through knowledge exchange.